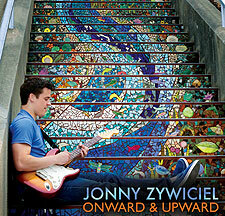 Musical destiny had its roots in Jonny Zywiciel’s youngest years. He began banging on his family’s grand piano as soon as he learned how to walk, and would sit there for hours, captivated, creating melodies and singing along as best he could. He spent his youth listening to pop and rock music, which finally prompted him to pick up a guitar at age 13. He played in many different bands and acts throughout his middle and high school years, headlining the historic Bottom of the Hill club in San Francisco, The Starry Plough in Berkeley (where Journey got their start) while honing his skills as a guitarist and songwriter. His debut album, the eight track Onward & Upward kicks off with the John Mayeresque 'Magnets'. A delightful little ditty, chock full of human sentiments of an unexplained force that brings two together, it is backed by the gentle pop guitar bounce of 'Everything', before drifting beautifully into the vocally trippy 'Faith'. With guitar work heavily inspired by, to my ears from the off, both Jimi Hendrix and Stevie Ray Vaughan, and vocals reminiscent of Ed Sheeran, Sam Smith, and the aforementioned John Mayer, next up is the uptempo ballad 'Take You Out'. The flowing 'Time To Heal', his first single, and his first video-making experience therein, is next, and showcases Zywiciel's vocal tones much more than his usual guitar-laden songs. A gentle drum beat soon gives way to yet another very pleasing, summery song, 'Melodies & Memories'. I mean, come on, and with two tracks left to cover, can this kid put a musical foot wrong? That jangling beauty is then followed by the strategically paced, thought provoking 'Wait', which in turn is backed by the album closer, the lush living room hipsway of 'Boomerang'. This album is brilliant, from start to finish and having now listened to it three times through, I have to make you aware of a rarity in this business - this album gets better with each listen, of that you have my word. But then again, don't just take my word for it, buy the damn album for yourself and find out!